Best Coffee Maker with Grinder [Updated 2019]: Brew it like a Barista! The brewing of coffee is a very delicate and intimate process. Having the best-quality beans is not enough. In 2019, it is crucial that you only use the best coffee maker with a grinder that concocts and brings out all of your coffee’s flavors and benefits. Therefore, driven by our love for coffee and, of course, our desire to inform, we researched and tested several coffee makers on the market for you. Some turned out great and some, well, not so great. Although it was difficult to settle on an outright winner unanimously, we were impressed with several options. Of these, we believe that you will find the one that best suits your needs. 1 What is the Best Coffee Maker with Grinder to Buy in 2019? 3.1 Why is it better to grind your own coffee? 3.2 What are the main differences between Blade Grinders and Burr Grinders? 3.3 What are the main differences between Glass Carafes and Thermal Carafes? 3.4 Who should choose a coffee maker with a glass carafe? 3.5 Who should choose a coffee maker with a thermal carafe? 3.6 What are other attributes to look for when searching for a coffee maker with a grinder? 5.1 Could you rate my Best Coffee Maker with Grinder Guide? What is the Best Coffee Maker with Grinder to Buy in 2019? Black and Decker are among the world’s most respected producers of consumer electronics – and their CM5000 coffee maker is not different from is siblings. It provides Black and Decker’s renowned superior build quality and reliability. The CM5000, as we shall call it here, combines creativity and technology to serve you with a personalized cup of coffee in as little time as possible. Its main appeal is its QuickTouch feature that not only controls the time and strength of the brew but integrates an auto brew feature to allow you to program when the machine makes the coffee. It is also easy to use as the control panel features large, clearly marked buttons and a backlit display for the time and program interface. Although the CM5000 has a built-in grinder, you are presented with the option of turning it off if you prefer to use pre-ground coffee. The Sneak-a-Cup™ pauses the flow of coffee to let you pour a cup amidst brewing without making a mess. It comes in handy on those late mornings. The device comes with a bronze tone permanent filter to eliminate the need for removable filters. The Glass Duralife 12-cup carafe gives you a clear view of the amount of water in the machine. It sits on a non-stick carafe plate with a “Keep Hot” for heating your coffee even when the machine is not in use. 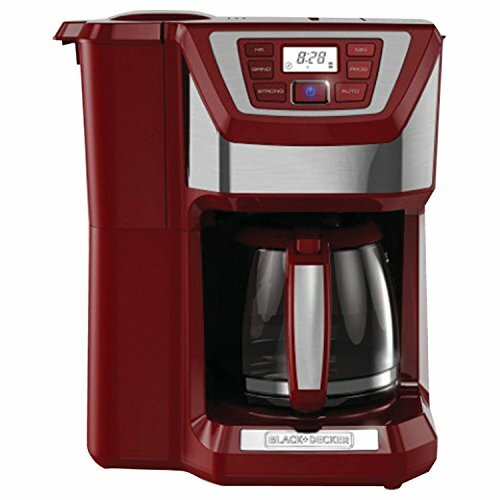 The CM5000 coffee maker measures 10″ by 13.5″ by 15.5″ and weighs about 9.5 pounds and is offered with a two-year limited warranty. The Black and Decker CM5000 is ideal for budget users who are always on the go, or in a hurry. It is also suitable for the office or large families because of its twelve-cup capacity. Its commonly used parts, such as the basket and the filter, are very easy to clean. It is offered standard with refillable capsules which are relatively cheaper than single-coffee capsules. It is widely programmable thus allowing you to pre-set a time when you would want your coffee brewed. It comes with a brew strength selector which allows you to determine how strong or mild you want your coffee to be. Its sturdy grinder is durable and reliable. Most experts claim that it produces coffee that tastes much better than most of its competitors’. Its uncomplicated, large buttons make it simple to use. Its grind and brew basket can be easily removed for cleaning, storage, or transportation. It is safe to use as it has features in place to reduce the occurrence of accidents. It is a cheap option compared to most of its competitors. It feels and looks quite large by normal standards and therefore not suitable for small kitchen spaces. The grind cannot be separated from the machine, thus, cannot work alone. As much as its buttons are logically arranged, they are too many and can cause confusion. From Cuisinart comes the DGB-625BC, a sleek yet rugged coffee maker with a powerful grinder. It is one of the most popular coffee makers on the market – and for a good reason. It is equipped with a vast list of amazing and handy features meant to ease and personalize your coffee brewing process. The Cuisinart DGB-625BC is a fully automatic coffee machine designed to do all the work for you. It has capabilities for grinding, mixing, and heating without much effort from you. What is even better is that the grinder is as low-noise as they come. Note that I do not use the word “quiet” simply because there is not an entirely silent grinder out there. This coffee maker can also brew coffee from already grounded coffee if you would rather skip the grinding process. 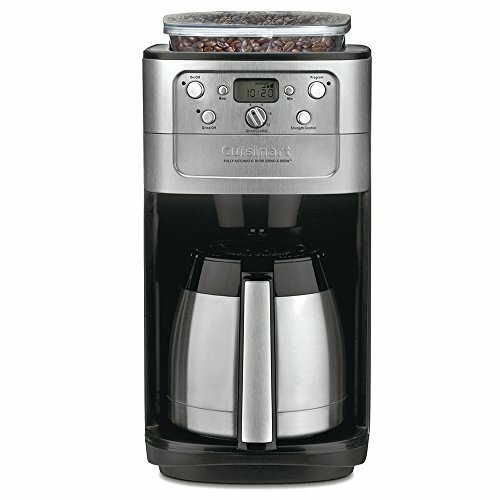 It employs Cuisinart’s advanced coffee making technology to deliver full-bodied coffee with unforgettable flavor. 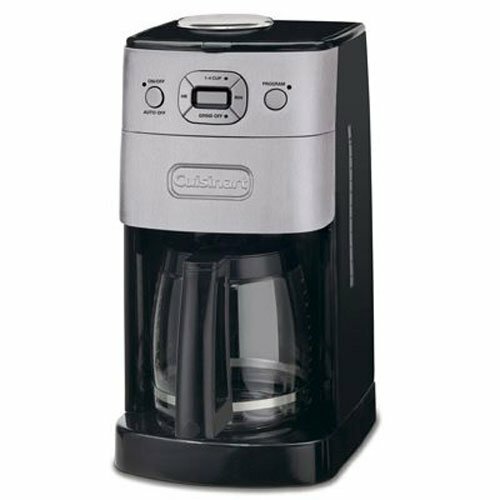 Fully programmable, the Cuisinart DGB-625BC can be set up for “wake-up” coffee 24 hours before the specified time. And we all know that there is nothing that beats the aroma of freshly brewed coffee in the morning. The programmable grind setting also enables you to determine how ground you want your beans, which will most definitely determine the flavor of your beverage. Interestingly, there is also an auto shut-off feature that helps you to manage its operational time. The machine also has a programmable timer and 1-4 cup brewing option. The Brew Pause feature allows you to halt the brewing process so as to pour yourself a cup of steaming hot coffee before the flask is full. The Cuisinart DGB-625BC can be ideal for both a single user or a group setting. That is because as much as its carafe holds twelve cups, it can be adjusted to accommodate a 1-4 cup brewing option. It is not very fitting for a beginner coffee maker because of its tons of features. It is versatile and thus it is an asset in any kitchen or office. It is very attractive with its European-style streamlined body, a stainless steel frame and even a digital clock on the front. The craftsmanship is also impressive as it is better-built than most of its competitors. It comes with a very detailed user manual, which you may probably not need because of the straight forward controls. Most coffee enthusiasts concur that this machine makes comparably delicious coffee. The coffee maker, not necessarily the grinder, works exceptionally silently. It is rugged and will survive several bangs and falls before it hangs its gloves – of course, their intensity also matters. It is offered with a three-year warranty that gives it an advantage over other models which offer one-year warranties. It features six removable parts which make cleaning quite cumbersome. Cuisinart claims that the parts are dishwasher friendly, but some users experienced leaking carafe issues afterward. Cuisinart seems to be a gift that never stops giving, especially when it comes to grind and brew coffee makers. 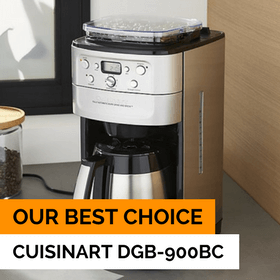 The Cuisinart DGB-900BC is one of the most critically acclaimed coffee makers on the market. 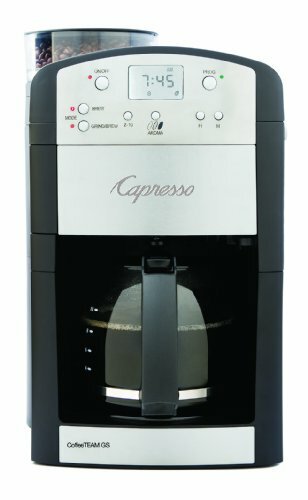 It is offered with a plethora of standard features to fill your cup with coffee that your taste buds will surely savor. Attractively clad in a shiny skin of brushed chrome and black plastic accents, its aesthetics can fit in in any modern kitchen. It measures 16.3 inches by 8.3 inches by 11.6 inches and weighs 9.5 pounds including its 2-pound carafe. Its girth is excused by the inclusion of a built-in burr grinder which is much more effective than blade grinders. The transparent hopper sitting on top of the Cuisinart DGB-900BC holds half a pound worth of whole coffee beans. The hopper is also airtight to prevent the beans from going bad. It comes with a double-walled thermal carafe that seals in heat to ensure that your coffee stays heated for longer. It is also convenient that the carafe can make and hold up to twelve cups. Like its sibling above, it allows you to use pre-ground coffee instead. Perhaps one of its strongest selling points is the built-in charcoal water filter which eliminates all impurities and removes any traces of chlorine in the water. Being fully programmable, the Cuisinart DGB-900BC can be set to brew coffee at a particular time. This is yet another Cuisinart product that ensures that you wake up to the sweet aroma, and taste, of fresh-brewed coffee. Its ruggedness, reliability, and practicality have made it one of the best-selling coffee makers on the market. It is an excellent coffee maker, perhaps one of the best out there. Its size and a medium/high price tag make it impractical for most domestic setups. It can serve you better in an office or if you receive many coffee-loving guests on a regular basis. It is offered with a three-year manufacturer warranty. A gold tone permanent filter eliminates the need for wasteful temporary filters. The burr grinder performs better than the conventional blade grinders on most other models. It is attractive and can fit in with most kitchen appliances. It is straightforward and convenient to use and comes with a detailed user manual. It has a powerful heater that heats water to substantially high temperatures, thus treating you to a steaming cup of coffee each time. It comes with an aroma feature which amplifies the aroma to fill up the room. It is bulky and therefore not practical in small kitchens. The carafe is designed such that you might have to overturn it to pour out the last drop completely. Enter the Breville BDC650BSS, a first of its kind household grinder with an adjustable grinder and calibration function that enables you to customize the grind size and coffee volume. It makes use of a machined stainless steel burr grinder to provide consistently sized particle sizes. Then it boils water to the optimal temperature before dispensing the coffee in appropriate proportions so as to bring out the coffee’s essential flavors. It offers a ‘Steep and Release’ function which balances the release of coffee flavors into the brew to ensure that a full-bodied taste is achieved. The eight strength settings help you to determine the intensity of your coffee, while the Pre-Ground Coffee option enables you to brew using pre-ground coffee. The Breville BDC650BSS includes a removable drip tray for 7.5″ height clearance which conveniently lets you brew any size without sacrificing taste. Subject to your preferences you can choose to brew into a travel mug, a tall cup, or the provided carafe. It features a 0.5-pound bean hopper that seals out all the air to prevent rotting of the beans. Although the machine does all the work for you, it keeps you informed every step of the way. That is facilitated by an LCD screen that projects real-time information on the size of the grind, the level of water, the time of grinding, the strength of the selection, etc. Like all the machines mentioned above, this one also comes with a Programmable Auto-Start feature which automatically starts the brewing process at the pre-set time. The Breville BDC650BSS measures 9″ x 14″ x 17″ high and comes standard with a GoldTone filter to eliminate the use of refillable filters. Although it is made in China, it is designed to the United States electrical standards. Anything Goes: Its versatility makes it ideal for office use, a family, or a single person – that is if you do not mind the price tag. It produces very balanced coffee. It is compact and light. It allows you to regulate the concentration of your coffee. It allows you to brew any size of coffee beans according to your preference. You are at liberty to brew whatever quantity of coffee you need. It can be too expensive for most users. The bean hopper is comparably small for its capacity. The Capresso 464.05 CoffeeTeam GS is as digital and customizable as coffee machines come. It is availed with a glass carafe with a 10-cup capacity. With this device, you can customize the brew quantity in five different proportions: 2, 4, 6, 8 or 10. You can also determine whether you want your coffee mild, regular, or strong. It employs a high-tech solid steel conical burr which grinds slowly thus imparting minimal heat which in turn preserve more aroma and produces more uniform grind. The GoldTone filter’s holder also stays inside to limit mechanical movements hence leading to noise reduction. The Capresso CoffeeTEAM GS gives you the power to use either the manual or automatic operation. The Direct-Feed mechanism makes it possible to grind and brew fresh coffee with every brew. A 200º F brewing temperature creates an intense brewing condition to allow for proper integration of flavors, and a Stop-and-Serve technology enables you to pour a quick cup in mid-brew with minimal mess. It features an LCD screen complete with a clock and timer that shows grind and strength settings. It comes with a 6-oz. Capacity bean hopper and measures approximately 9-1/5 by 9-1/5 by 15-1/5 inches. The Capresso CoffeeTEAM GS‘s non-stick warming plate heats the carafe to keep the coffee at a temperature of about 180º F for 2 hours before the auto shut-off function kicks in. Although the price may be a bit stiff, this coffee maker is ideal for domestic use. It can also be utilized in an office or business setup. The use of a permanent GoldTone filter eases cleaning and reduces costs. It has a large bean container that can hold enough beans for about twenty cups. Its finesse settings allow you to customize the grinding intensity according to the type and size of the beans. It is provided with a detachable transparent cover that affords you a view of the brewing process. It is accessorized with a charcoal water filter that removes almost all traces of chlorine and impurities. It has an easy-fill frontal water tank. It is easy to clean as its exterior is wipe-cleanable and interior parts are easily removable. A medium/high price tag may prove too expensive for some buyers. 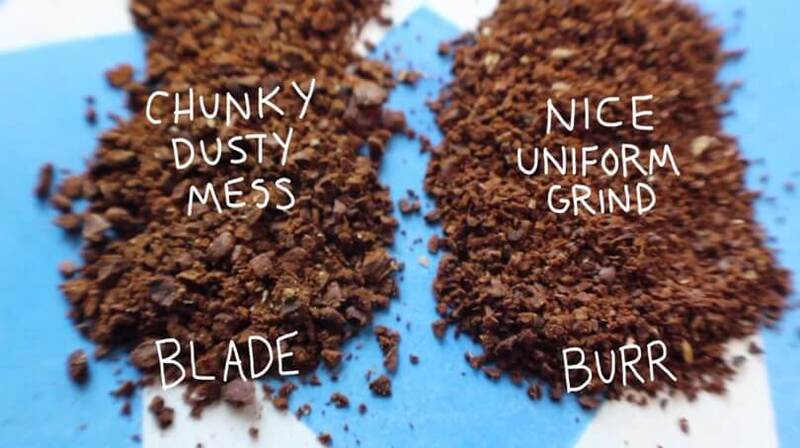 Why is it better to grind your own coffee? A whole coffee bean is a shell that protects the coffee essential coffee oils from contamination. It only takes about fifteen minutes for a coffee bean to lose almost 60% of its aroma after exposure to oxygen. 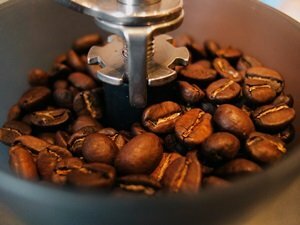 That being the case, grinding your own coffee just before brewing prevents it from losing most of its caffeine content and flavor. What are the main differences between Blade Grinders and Burr Grinders? Source: Dear Coffe, I Love You! A Burr Grinder is made up of two revolving abrasive surfaces separated by a controllable distance in between which the coffee is ground. A Blade Grinder, on the other hand, utilizes a fast-spinning blade to chop coffee beans while mixing them. Although Blade grinders are faster, Burr grinders are preferred by many because they produce consistently sized particles. What are the main differences between Glass Carafes and Thermal Carafes? Simply put, a glass carafe is made of glass – duh – and a thermal carafe is usually made using insulated stainless steel. Who should choose a coffee maker with a glass carafe? Glass carafes are usually calibrated and are suited for users who require precision, such as businesses. They also lose heat fast which makes them ideal for fast or volume drinkers. Who should choose a coffee maker with a thermal carafe? Thermal carafes have a vacuum inside which helps to prevent loss of heat. That makes them ideal for persons who like to take their coffee luxuriously. 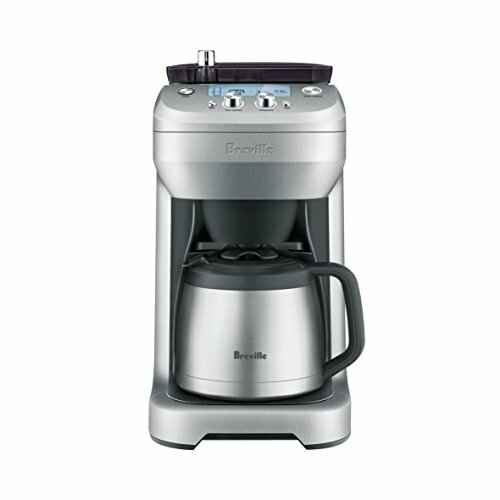 What are other attributes to look for when searching for a coffee maker with a grinder? 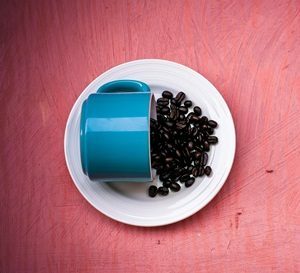 Capacity – while bigger is always better, buying a coffee maker with a 12-cup capacity if you live alone can be wasteful. You will not only have to wait longer for a single cup of coffee but pay more in power bills. Shut-off System – it is essential that you opt for a coffee maker that will shut off correctly to preserve power and avoid burning the coffee. Pricing – expensive is not always better. Some coffee makers sell brand names and not features. It is not unheard of for a cheap machine to perform better than a costlier one. Custom Settings – the more, the better? Well, in most cases, yes but sometimes things can get too complicated, and you would wish that you went for the no-frills option. It is up to you here. The fact that you have read up to this point shows that you are an avid coffee lover. If you too are as specific about your coffee as James Bond is about his Martini, then you should self-grind your coffee. Our list features some of the most affordable, yet capable, coffee makers on the market. It is wiser to purchase a coffee maker with included grinders as grinders by themselves are quite expensive. Although we cannot pinpoint the best device among these, we can say with a high degree of certainty that none of them shall disappoint. We hope that the list assists you to make a more informed decision than you would have done before. 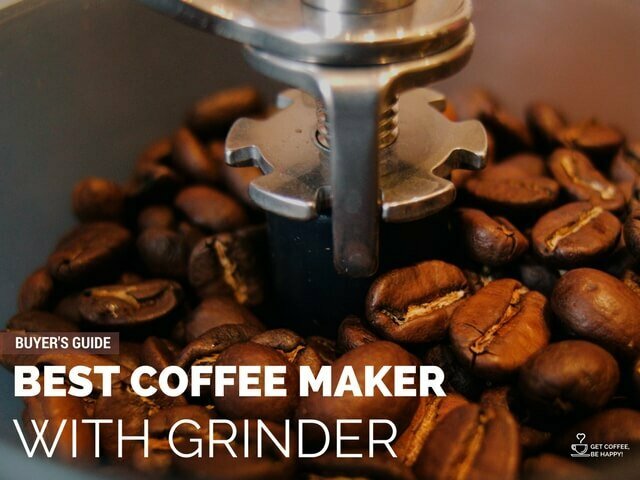 Could you rate my Best Coffee Maker with Grinder Guide? Find the Best Coffee Maker with Grinder 2019 with our Reviews & Buyer's Guide. Read our reviews to compare taste, speed, ease of use, and ease of cleaning. NAVIGATE OUR TOP 5 COFFEE MAKERS WITH GRINDER!